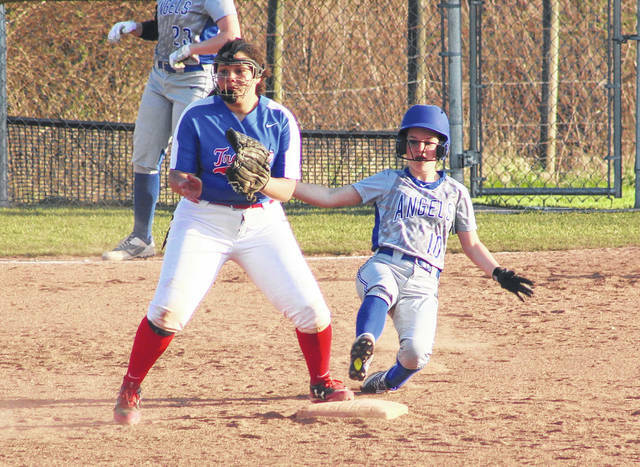 Gallia Academy freshman Malerie Stanley slides safely into second base during the sixth inning of Friday night’s OVC softball contest against Portsmouth in Centenary, Ohio. CENTENARY, Ohio — It just took a little time to warm up. Visiting Portsmouth stormed out to a 4-0 lead midway through the third inning, but the Gallia Academy softball team scored 14 unanswered runs over the next three-plus frames while claiming a 14-4 mercy-rule victory on Friday night in an Ohio Valley Conference contest at the Eastman Athletic Complex in Gallia County. The host Blue Angels (7-1, 5-1 OVC) dug themselves an early hole after a Shaya Kidder leadoff single and an error gave the Lady Trojans a 1-0 advantage three batters in, then a three-run homer by Jacqueline Batista in the top of the third gave PHS a substantial four-run cushion just 15 outs into the game. The Blue and White, however, found their rhythm in the home half of the third after sending nine batters to the plate, which yielded three runs on two hits, a walk and three PHS errors. Still trailing 4-3, the Blue Angels secured a permanent lead in the fourth after producing a pair of runs. Bailey Young reached on a bunt single and later scored on an overthrow error that followed an Alex Barnes bunt single. Barnes later scored on another error to give GAHS a 5-4 edge after four full frames. 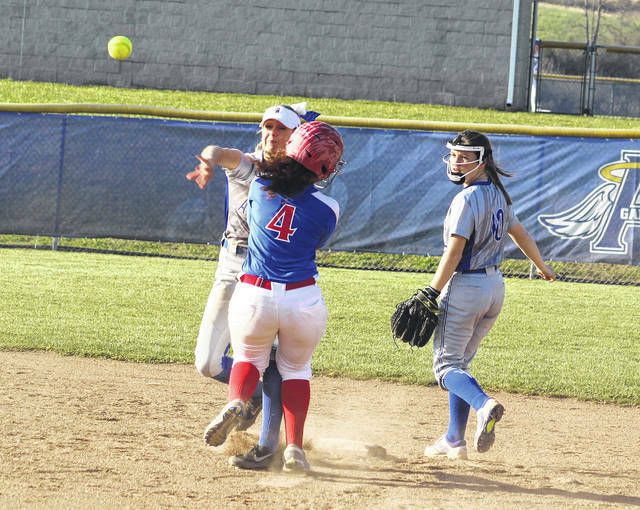 Gallia Academy sent nine batters to the plate in the fifth, which resulted in five runs on five hits and a hit batter — increasing the hosts’ lead to 10-4. The Blue Angels had six consecutive hitters reach base in the bottom of the sixth, which led to the final four runs and a walk-off victory. Bailey Young delivered a bases-loaded single that plated both Malerie Stanley and Allie Young for a 12-4 lead, then Aubrey Unroe scored on a bunt single by Barnes. Hunter Copley sealed the deal with a single that allowed Young to come home with the game-clinching score. The hosts outhit the Lady Trojans by a 14-5 overall margin and also benefited from six of the seven errors in the contest. GAHS stranded nine runners on base, while PHS left only three on the bags. Bailey Meadows was the winning pitcher of record after allowing three earned runs, five hits and one walk over six innings while striking out four. Kylee Montgomery took the loss after surrendering eight earned runs, 14 hits and three walks over five-plus frames while fanning one. 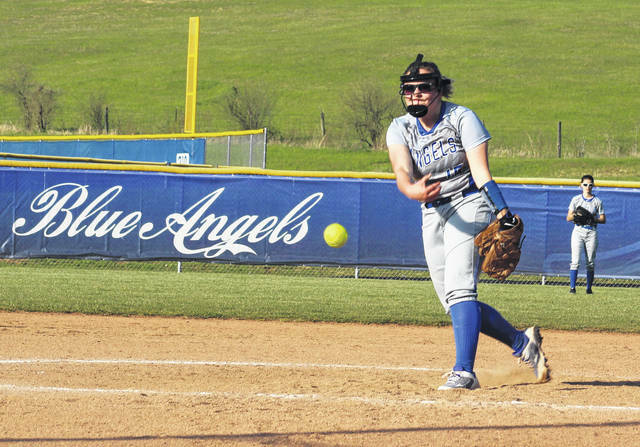 Barnes and Bailey Young paced Gallia Academy with three hits apiece, followed by Copley, Stanley and Ryelee Sipple with two hits each. Meadows and Allie Young also had a hit apiece for the victors. Meadows drove in a team-high three RBIs, while Copley and Bailey Young each knocked in two RBIs. Bailey Young also scored a team-best four runs and Barnes followed with three scores. Batista, Kidder, Sharia Kearns, Cassie Potts and Reagan Grooms had a hit apiece for Portsmouth. Batista accounted for all three RBIs in the setback.